DIY - Sumo Wrestling Match fundraiser! appearance of the overweight Sumo Wrestlers might just bring the spectators to the floor, so watch out! This one is a real crowd pleaser! Rumford, ME: Picture giant Beanie Baby sumo wrestlers bouncing around a mat and you’ll get a good idea of what this is like. The debut event at Mountain Valley High School pitted community and business members and students against each other for rollicking laughs in the fundraiser for the Greater Rumford Community Center and its programs. Wrestlers resembled giant beach balls with tiny legs and chicken-wing arms in the inflated suits as they tried to fling opponents to the mat or push or bounce them out of the large ring. “It was a blast,” Rumford police Sgt. Doug Maifeld said, icing a knee injury that quickly ended his second match with Dixfield police Officer Eric Bernier. “But you’d be surprised at how winded you can get. I just wish my knee hadn’t popped out,” he said. Wearing a red sumo suit and red helmet, Maifeld resembled a squat, chubby strawberry to Bernier’s tall, imposing, blueberry-like suit. Matches began with MVHS freshman, sophomore, junior and senior boys wrestling each other, and likewise with the girls, until there was a lone winning class. One group of four teenage girls tried to push their opponents out of the ring, when three suddenly fell and rolled around like giant fruit, unable to get up. The final match featured MVHS Principal Matt Gilbert and his assistant, Chris Decker, versus their Dirigo High School counterparts Mike Poulin and Chris Moreau. Redstone, CO: Redstone Elementary School Principal Laura Wilson faced off against Vice-Principal Karen Puga during a reward sumo wrestling match for their students. Redstone raised $54,779.45 for technology during their Move-a-Thon fundraiser, and earned special treats including the sumo match, two no-homework weeks, an electronics day and a special kickball game. Mt. Loafer, UT: Things were a little topsy-tervy, roley-poley, and just plain funny when the school principal met her matches on the mat as she battled the teachers at Sumo Wrestling! She had promised the classes who met their goal for the walk-a-thon, that she would wrestle their teachers on the mat! 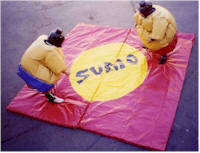 They dressed up as Sumo Wrestlers and grappled to the ground! There were cheers, and cries of victory from the teachers AND from the primcipal. Severance, CO: Range View Elementary School teacher Sarah Ward gets suits up to Sumo wrestle Principal Dan Seegmiller. Students at the school were told the principal would wrestle if they raised $5,000, but they exceeded their goal to raise $11,984.06 for cancer research.